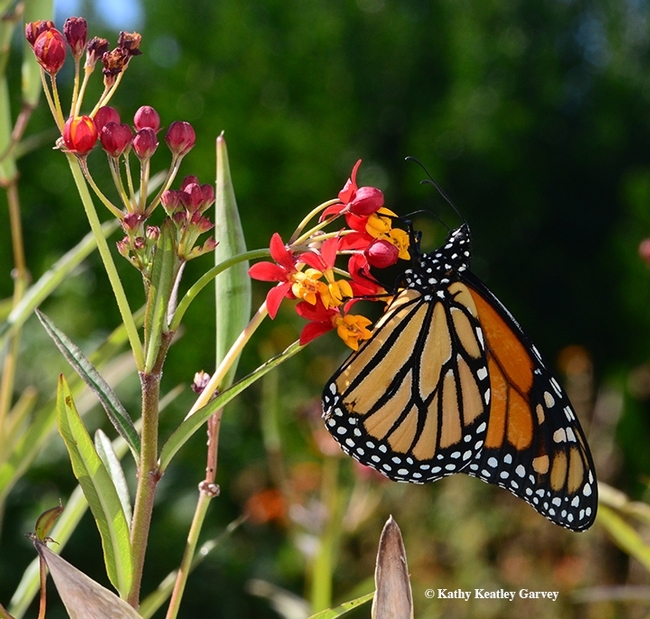 Friday the 13th is not an unlucky day--not when migratory monarchs make a pit stop at your home on their way to their overwintering sites. 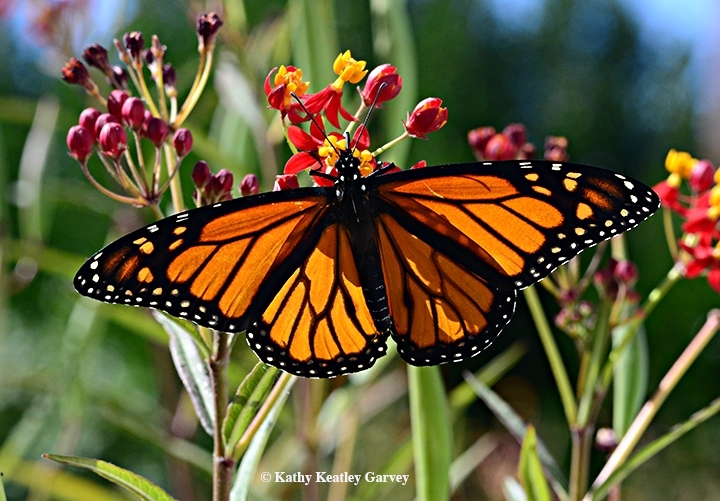 Today a male monarch fluttered into our pollinator garden in Vacaville, Calif., and sipped nectar from a tropical milkweed. We offered him a choice: Mexican sunflower, lavender, verbena, butterfly bush, sedum, lantana or the tropical milkweed. "Make mine milk (weed)," he seemed to say as he lingered on the plants. We're hoping his buddies will stop by, too. Any time. Friday the 13th is considered an unlucky day in Western superstition, according to Wikipedia. "It occurs when the 13th day of the month in the Gregorian calendar falls on a Friday, which can be the case at least once every year, and up to three times a year. In 2017, it occurs twice, on January 13 and October 13. There will be two Friday the 13ths per year until 2020, where 2021 and 2022 will have just one occurrence." In its online entry, Wikipedia outdoes itself. It lists all the Friday the 13ths that have occurred since 1900, and will occur until 2100. There's even a special name for it: "paraskevidekatriaphobia." That's Greek. Paraskeví means Friday, and dekatreís, 13. American psychotherapist Donald E. Dossey (1934-2016), who specializied in phobias and stress management, coined the term in the early nineties. He reportedly claimed that anyone able to pronounce the word would be cured of it. "Paraskevidekatriaphobia" does not exist in our household. Indeed, Friday the 13th is a lucky number. Our son is a Friday the 13th baby. So when that day rolls around--no matter how many times a year--we rejoice. It's a bonus when monarchs flutter into our yard. You could call it a slacker, a deadbeat, a moocher, a sponger, or a loafer. Or you could call it a cuckoo bee. 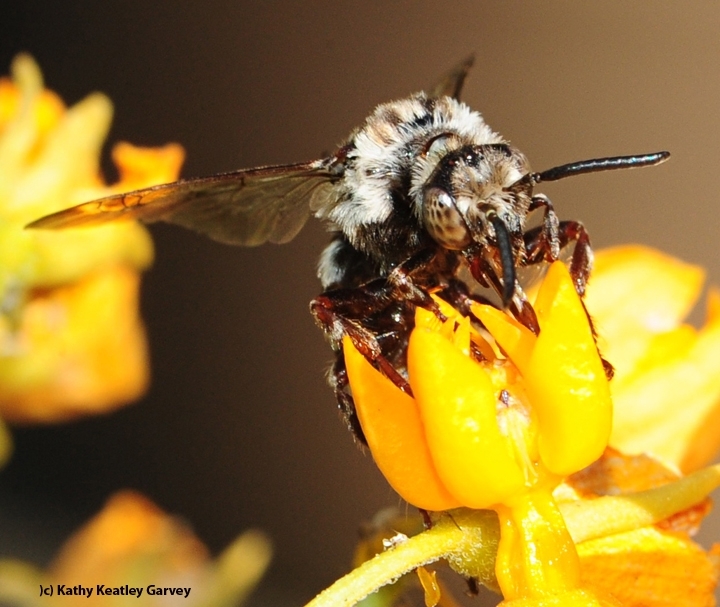 Take the cuckoo bee, Xeromelecta californica, a parasite of the digger bee, Anthophora. When the female Anthophora leaves its nest to collect more pollen, the female cuckoo bee sneaks in and lays an egg. "When the host female seals her nest, it seals the doom of her own offspring," distinguished emeritus professor Robbin Thorp of the UC Davis Department of Entomology and Nematology told the crowd at last week's 40th annual Western Apicultural Society meeting, held at UC Davis. They eat the provisions, a pollen ball meant for the host offspring, and kill and eat the host larvae. The cuckoo bee offspring emerge. 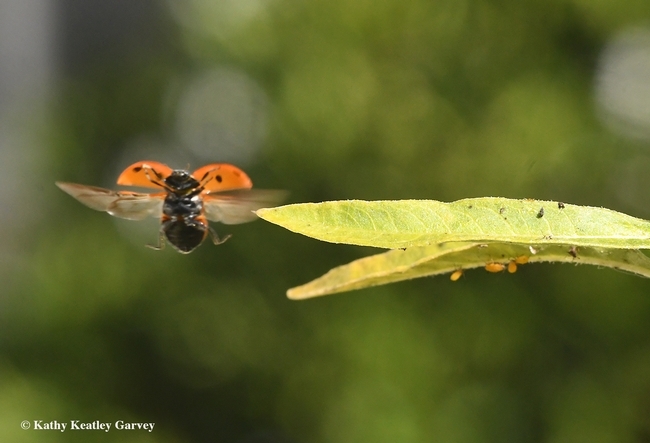 Thorp, co-author of California Bees and Blooms: A Guide for Gardeners and Naturalists, also called attention to their "pointy abdomen" and "wasp-looking appearance." But they are bees--cuckoo bees. 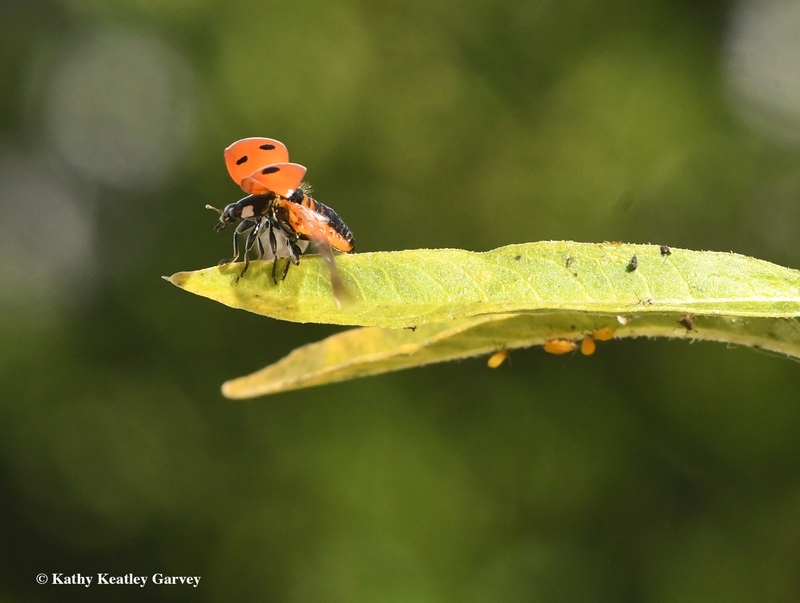 They're also called parasitic bees or "kleptoparasites" or "cleptoparasitises." They have no pollen-carrying/collecting apparatus, like a scopa, because they don't need any, Thorp said, just as they do not construct their own nests. 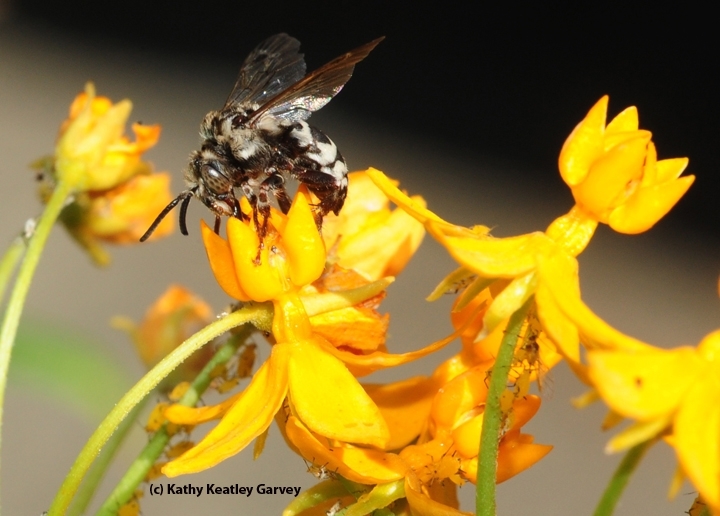 If you look around a pollinator garden, you just might sight some cuckoo bees. 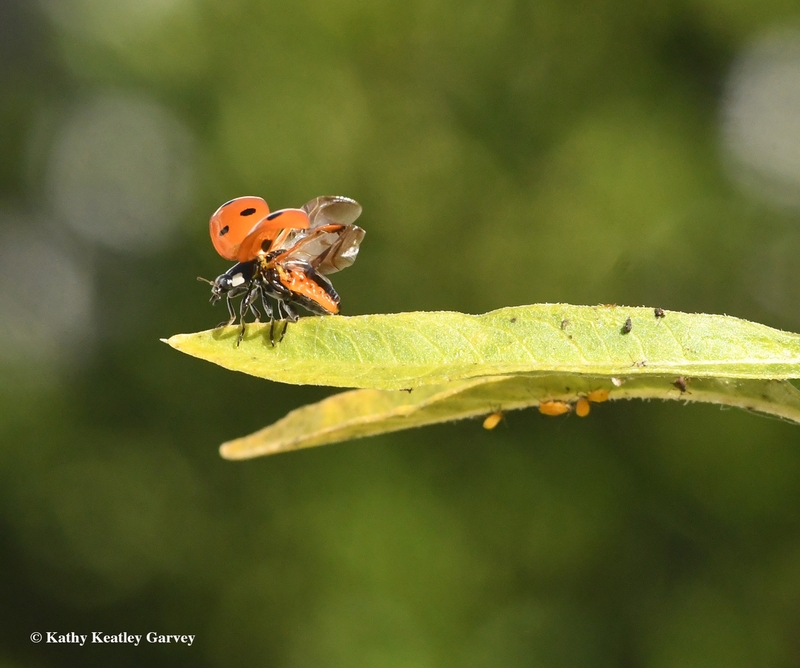 Last week we saw a Xeromelecta californica (as identified by Thorp and Lynn Kimsey, director of the Bohart Museum of Entomology and UC Davis professor of entomology). 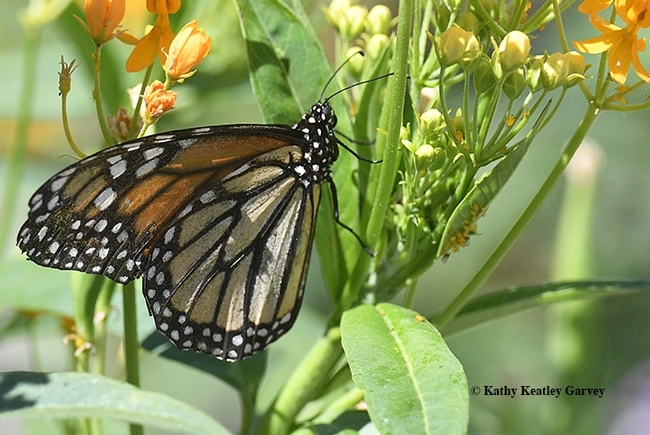 It was sipping nectar from a tropical milkweed, Asclepias curassavica. We've also spotted Anthophora urbana nectaring on our lavender. One thing's for certain: a cuckoo bee didn't lay its eggs in the Anthophora nest that time or the urbana wouldn't have been there. Are top-bar beekeeping hives for you? What are their advantages and disadvantages as compared to the traditional Langstroth hives? 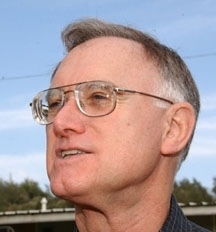 You'll learn all about top-bar hives when Les Crowder of Austin, Texas, discusses "Major Considerations in Top Bar Hive Management" at the Western Apicultural Society's 40th annual conference, set Sept. 5-8 at the University of California, Davis. Crowder will speak at 9:30 a.m., Thursday, Sept. 7 in the Activities and Recreation Center (ARC). Registration is still open to attend the conference. See registration. A top-bar hive is described as a single-story frameless bee hive with the comb hanging from removable bars. 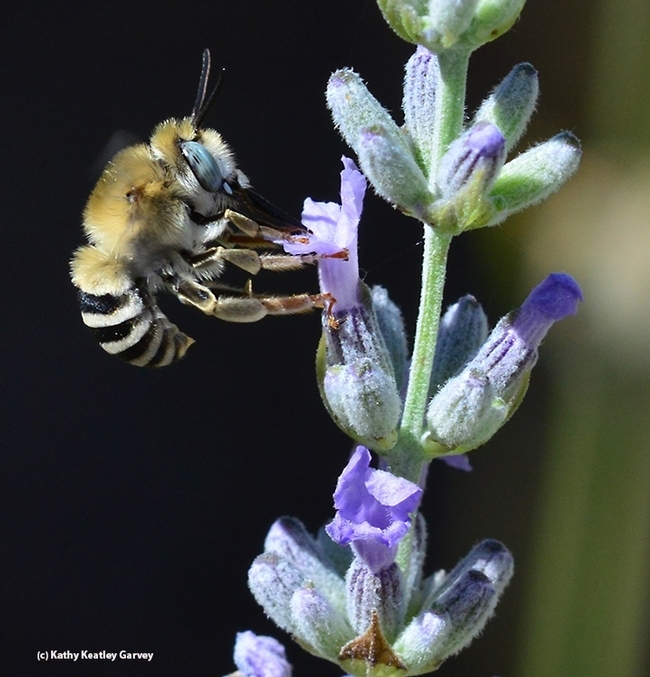 Crowder and Heather Harrell co-authored the book, Top-Bar Beekeeping: Organic Practices for Honeybee Health , published by Chelsea Green Publishing Co. in 2012 and soon to be published in Spanish. He continues to teach and advocate nontoxic management of beehives. Crowder says he began keeping bees--or the bees began keeping him--in Bernalillo, N.M., more than 40 years ago. "I began began looking for ways to raise bees without antibiotics in my teenage years and have been breeding honey bees for disease and parasite resistance since then. I also began early on to search for ways to regularly renew the combs in beehives because research indicated that old cocoon laden combs become havens for pathogenic fungi and bacteria that stress the bees' resistance to disease." He built his first top-bar hive in 1979 and eventually begin using them exclusively for his 100-200 hive honey and beeswax business. In his talk, Crowder will cover spring buildup, swarm prevention and making divides as a topbar beekeeper. In addition, he will compare and contrast top-bar hives with Langstroth hives. Crowder served as president of the New Mexico Beekeepers Association for many years. 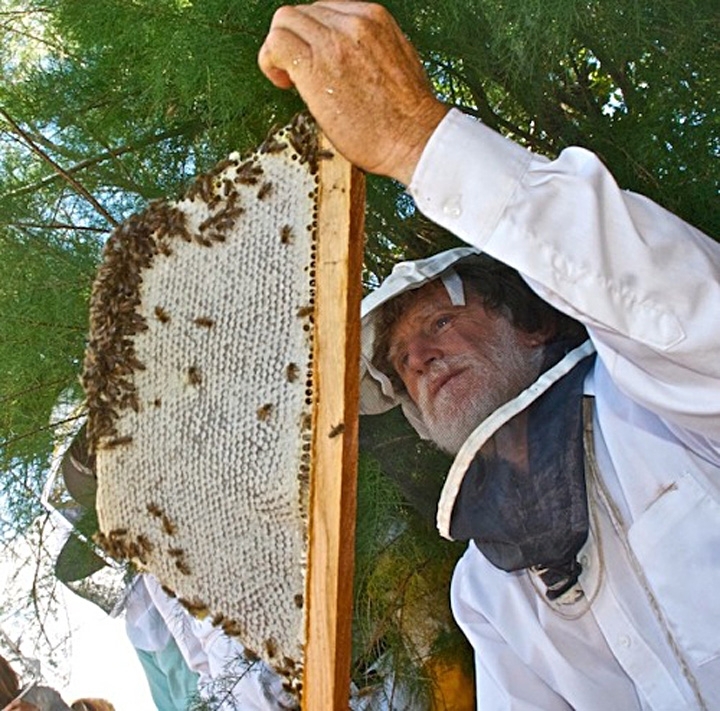 His credentials also include honey bee inspector for the New Mexico Department of Agriculture, and beekeeping instructor "in many parts of the world for more than 30 years." "There's a lot of interest in top-bar hives," said Western Apicultural Society president Eric Mussen, Extension apiculturist emeritus based at UC Davis. He expects an enthusiastic crowd at the four-day conference, which will include a variety of speakers, tours, networking, and a silent auction. See schedule. 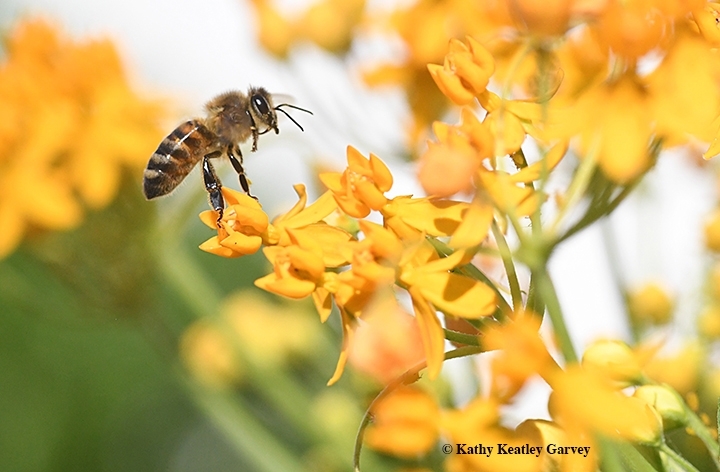 WAS, founded at UC Davis, is a non-profit, educational, beekeeping organization geared toward the benefit and enjoyment of all beekeepers in western North America, Mussen said. The group encourages membership from all over the world. However, the organization is specifically designed to meet the educational needs of beekeepers from Alaska, Arizona, California, Colorado, Hawaii, Idaho, Montana, Nevada, New Mexico, Oregon, Utah, Washington, and Wyoming as well as the provinces of Alberta, British Columbia, Saskatchewan and the Yukon. Contact Mussen at ecmussen@ucdavis.edu for more information. A little haggard, a little worn, a little ragged, a little torn. 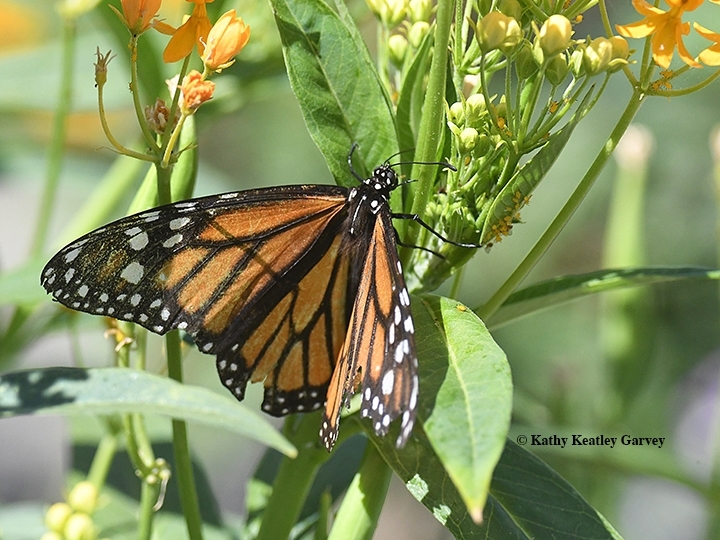 But there she was on Monday, Aug. 1, the first monarch of the season to lay eggs in our little pollinator garden in Vacaville, Calif.
She found the milkweed, but that was AFTER the aphids, milkweed bugs, praying mantids, assassin bugs and assorted spiders claimed it. 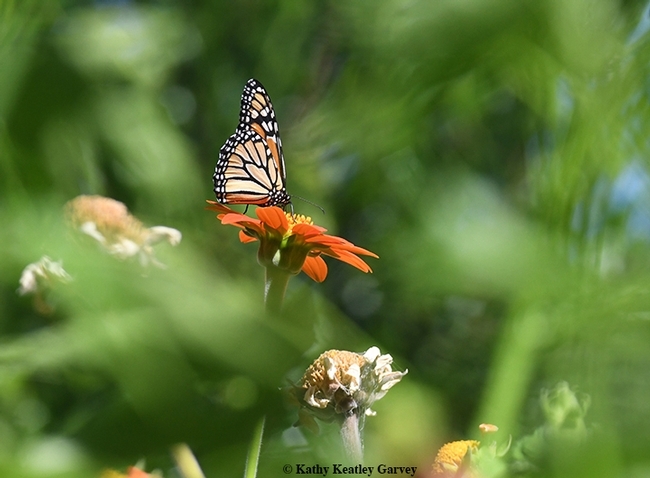 It's always a joy to see the majestic monarch fluttering through a pollinator garden. 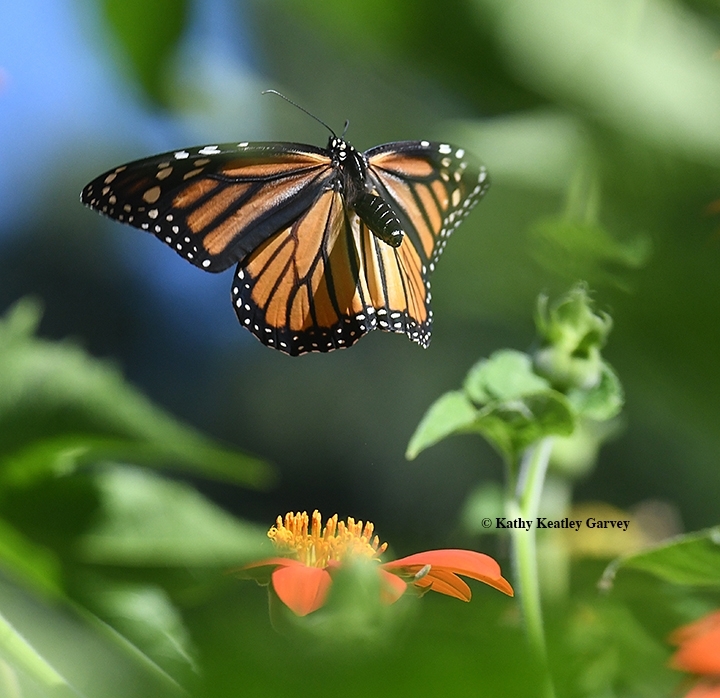 On Sunday, July 31, a male lingered for two hours, nectaring on the Mexican sunflower (Tithonia) as the male territorial longhorn bees tried to chase him away. No welcome mat for him! No place setting for him! Then today, a female arrived, first stopping by the showy milkweed, Asclepias speciosa, to lay eggs and then fluttering over to the tropical milkweed, Asclepias curassavica, to lay more. It's amazing how the monarchs, Danaus plexippus, know how to put their "resources" in multiple places. Like the idiom that cautions "don't put all your eggs in one basket," instinctively they seem to know that if they put all their resources in one place, they could lose them all. 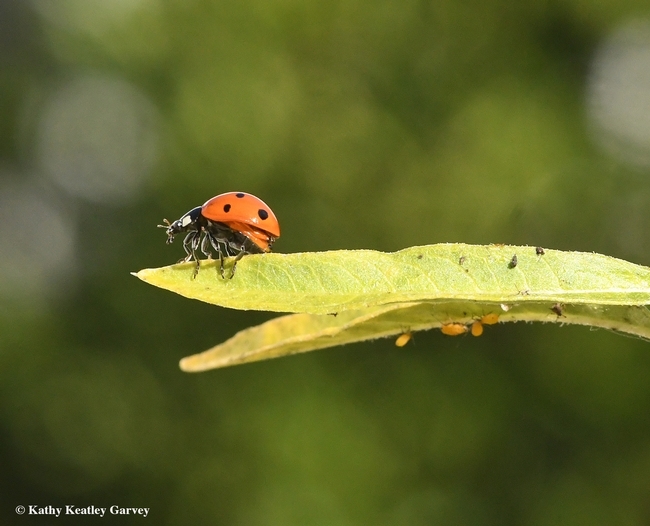 There's a better chance of offspring survival if they spread the eggs around.